*An early submission will get preference in case of review and publication process. 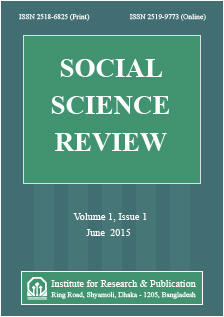 Social Science Review (SSR) is a double blind peer reviewed international journal. SSR publishes original papers, empirical research, case studies, literature review, conceptual framework, analytical and simulation models, technical notes, and book reviews. Special Issues devoted to important topics in business, humanities, social science and technology are occasionally published. The journal publishes research papers in the following fields.